Your guide to your free subscription to the New York Times newspaper. Thanks to a new library subscription, you have access to a free digital subscription to the New York Times. This is available to all Goshen College community members with a current GC login. Are you renewing your New York Times subscription? Skip to these directions. Complete the sign up form with your GC email or any other preferred email When you see the Start Your Access screen, you have successfully registered. Currently paying for a NYTimes digital subscription? If you want to switch your paid digital subscription to a GC sponsored free one, please contact NY Times directly to cancel your paid subscription (1-800-NYTIMES). 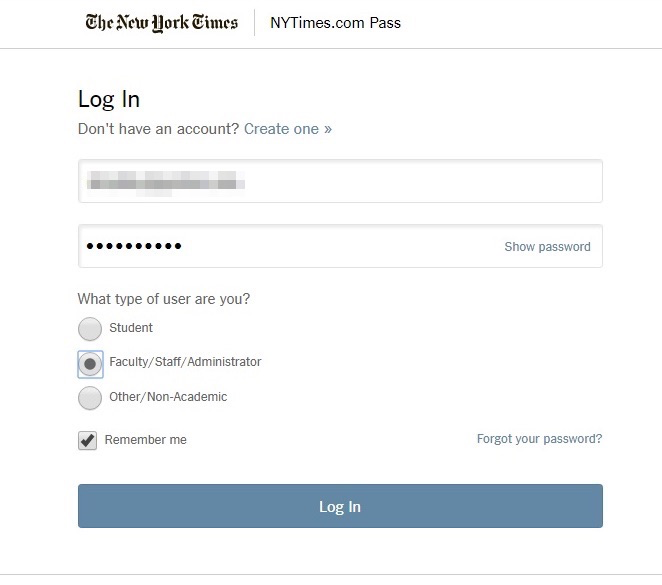 Once that subscription has been canceled ​​you may select the "Log in here" option and use the same login as from your paid NYTimes.com account. Already have a NYTimes user (as a free trial or email newsletter)? Go to the NYTimes.com sign-up page. Once there, click on "Log in here" instead and use your current NYTimes.com account to add the free digital subscription to your account. Go to the NYTimes.com sign-up page. You will be prompted to sign-in with your GC username and password. Once you have successfully signed-in, you will see a screen like the one below. 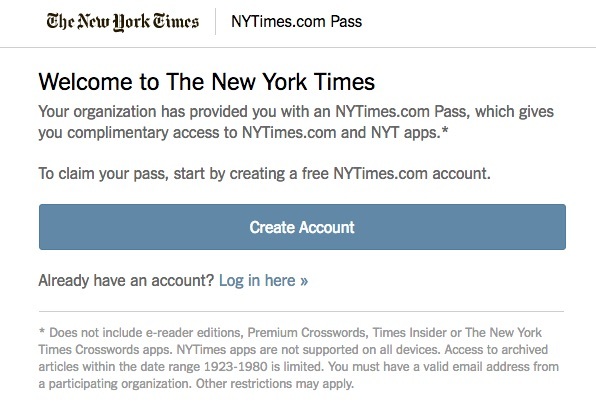 Select "Log in here"
Fill in the username and password for your expired New York Times subscription account. Then select the type of user you are. Once you log in you will have another year of free digital access to the New York Times newspaper. Enjoy!